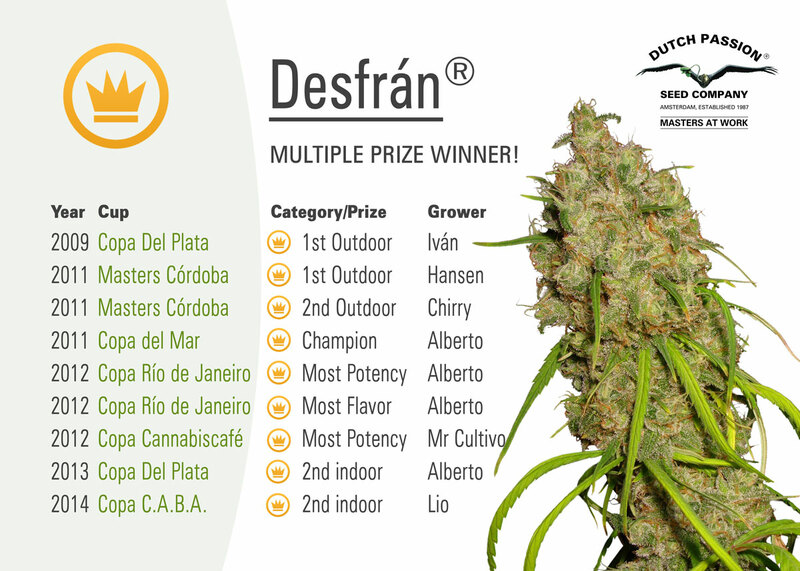 Desfrán is a legendary variety in South America and a multiple prize winner of many cannabis cups. Desfrán is the result of crossing Destroyer with Destroyer, she was originally a 3-way crossing of Mexican Oaxaca, Colombian Punto Rojo and Meao Thai and comes to Dutch Passion thanks to Alberto from Argentina. Alberto is a Master Grower, Cannabis Connoisseur and owner of Haze Magazine. Our first project together was to introduce Desfrán to Europe. During vegetative growth Desfrán needs little nutrition. 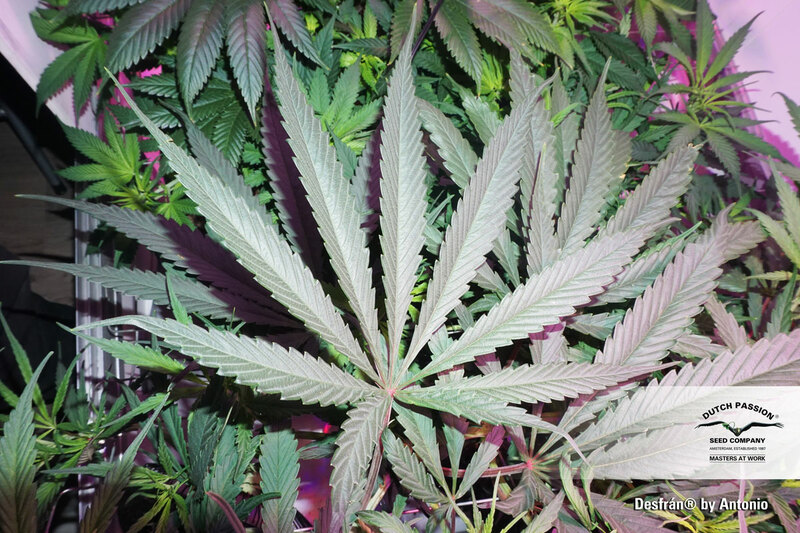 She grows well in soil especially with plenty of root space, and grows vigorously in other grow methods too. Desfrán is 100% Sativa so she can grow very tall and develops long branches which can dominate the airspace/growroom in no time. In vegetative growth the stem can produce intense fruity aromas when rubbed. During flower she stretches and can triple her height. 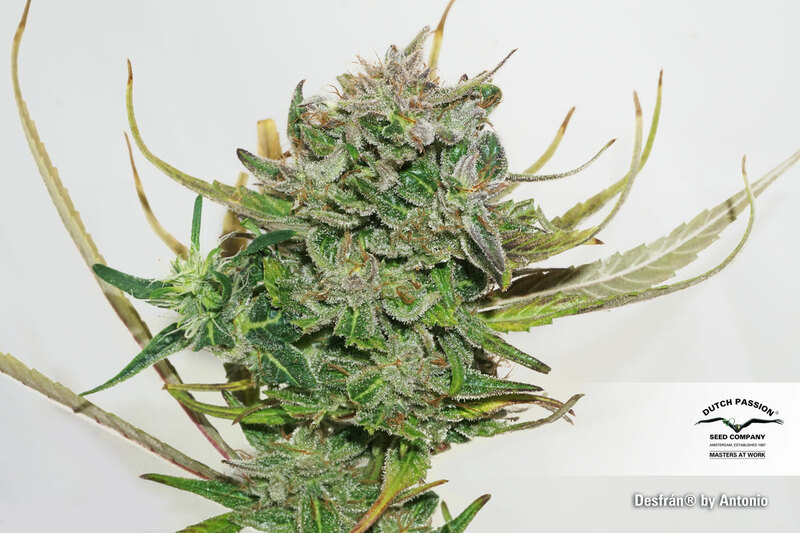 Desfrán is very resinous variety suited for SOG and SCROG grow methods and usually takes 9-10 weeks to flower. Desfrán has a fruity aroma like pear and green apples, the taste is like enjoying a pear caramel with hints of grape and melon. 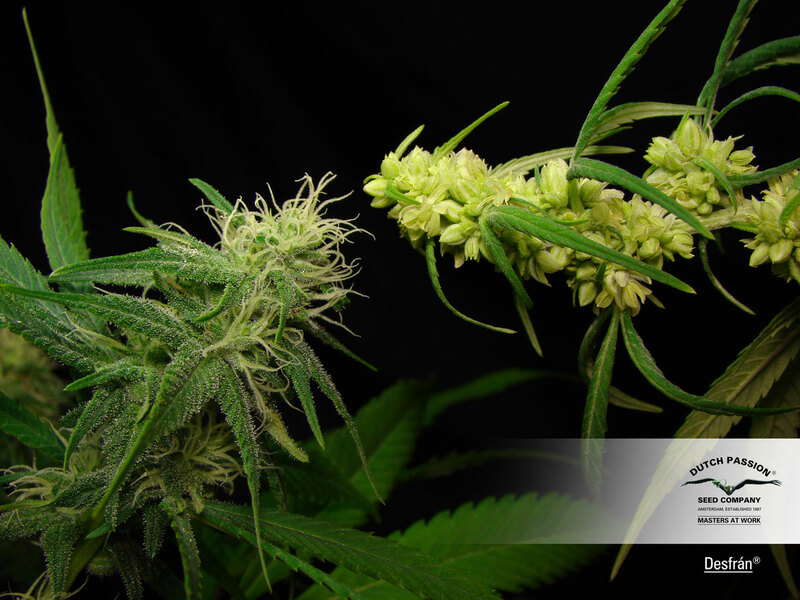 Desfrán produces unusually dense and compact flowers for a Sativa. When dried, the flowers look like glazed pinecones. Early harvest can result in a very cerebral and psychedelic high, if you harvest Desfrán late she tastes sweeter and is a true destroyer. Desfrán is one of the best varieties Alberto has ever seen, we hope you will think the same. there is a very slow mutant pheno, 3 sugar leaves, double finger fan leaves, somehow she topped herself. Ultra sensitive for nutrients.Crazy stretch. Bloom 14+!!! weeks. 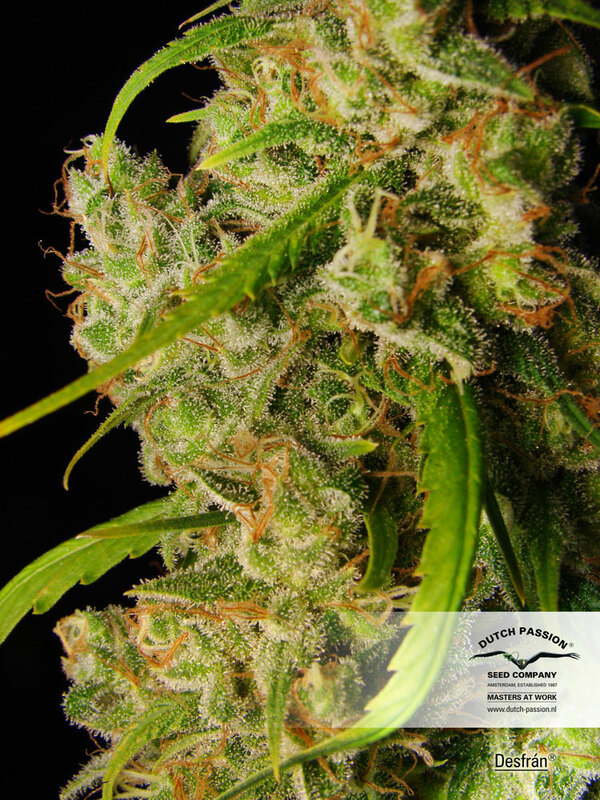 JASA, THC levels historically tend to vary according to the grow conditions, the experience of the grower, and the type of grow method. But this is a THC rich variety, when grown well THC should be around and above 20%. Where can I find the THC and CBD content on the different varieties? Hi LeMagiciendOz! Incredible coincidence catching your post. I'm about to start flowering more Desfran and am buying more seeds to start next one. Some details: 1.2 metre tent. 1x600 watt HPS. Cheap plastic Omega non-digital ballast I think. 5x18 litre pots, a mixture of reused compost (original mix had about 1/3 horse manure + sprinkling of Fish Blood and Bone) + batmix - about half and half. I added another sprinkle of FBB to "new" mix. Big Bud through weeks 2 - 4 of flower. Old Timer Grow for veg, OT Bloom for flowers. I partially mainlined to four colas during veg having read that Desfran is a very rangy plant; and more or less plaited and wound the colas around the net. At the end of the grow the net had lost ALL its elasticity! Completely knackered! I hand-watered throughout feeding a light dose, of bloom each time. Occasional Maxicrop added to water and/or leaf sprayed. About 10 weeks flowering. Beautiful sweet smelling herb. Thanks for your interest. Take care, Steve. Just completed 1 grow 5 plants 600watt 600 grams dried well trimmed Desfran. Wonderful herb. Sweet!